Mimi Chase wanted one perfect year. One year away from pack politics and her mother’s matchmaking efforts. Ever since her big brother settled into mating with a healer, Mimi’s mom seems to have gone into overtime in throwing her at every eligible male in the pack. Choosing to roam seemed the best option, and California an ideal location to get away from everything pack related. Her plans for art classes, yoga on the beach, maybe a cooking lesson or two while living a hippy dippy lifestyle are all she cares about…until another wolf butts into her every activity - doesn’t he know the rules? I want to be the guy you run to...not from. 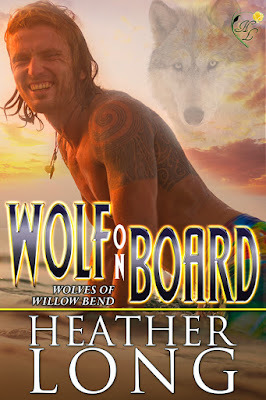 Another wonderful installment in Heather Long’s Wolves of Willow Bend series! Although mainly a love story between two lone wolves, this quick read does a great job setting up the next arc in the overall series. Jake is still trying to recover from the tragic events his pack suffered. He’s become a lone wolf, roaming around the west coast, trying to find some peace. Mimi is looking to get away from the pressures of her pack and find herself. She’s not really sure what she wants and has been given a year leave to find herself. Jake knows he wants Mimi, he just needs to figure out how to get her to give him a chance. Once again we are treated to some great characters who can make us laugh, swoon, and keep us captivated to find out where the story is going to take us. And even though this story mainly focused on the relationship between Jake and Mimi, the foreign wolf threat is woven into their story to give a wonderful tie in to the previous books in the series and also set up the next set of books. I can’t say enough about this world that Heather Long has created. Although this can be read as a standalone, there is so much to this world it would be a shame not to treat yourself to the entire series! Another great read by Heather Long that I would highly recommend.